Originally launched in Switzerland in the 1940’s, Araldite epoxy resins were manufactured in the UK from the 1950’s and soon, this highly effective adhesive known for its industrial style strength, was a popular choice for professionals and households up and down the country. Araldite has a long history of playing a part in the manufacture of racing cars and aeroplane wings and it is these professional types of applications that have helped its popularity with the general public. The current range of 2 part Araldite adhesives are easy to use and produce a strong bond between many types of materials including glass, ceramics, leather, wood, various metals, rubber, most types of hard plastics and even masonry. This means that they are suitable for a huge range of household repairs, both indoors and outdoors, and are also suitable for arts and crafts. There are even some applications for the motorist. Once used, due to its incredible strength, Araldite is a brand that will stay in the memory banks for life as the “go to” adhesive for those household repairs. 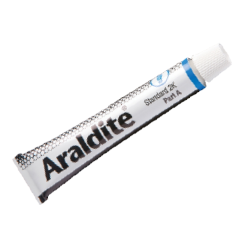 Araldite also produce a super-glue-type, fast-drying adhesive that bonds in seconds and can be applied using a very easy to use dispenser.